Mexicans Agony Lords are an established band (of whom I heard nothing heretofore) who have taken a 13 year break between albums. This might explain the fact why they are not a particularly known commodity. Maybe they should be better recognized only because they are trying to be non-conformal to the notions of the genre they are loosely associated with, melodic death metal. 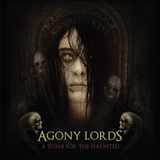 Breaking completely away from the Swedish + millions of other followers crowd, “melodic” for Agony Lords means melodic classic metal/NWOBHM/their own riffs, while “deathly” nature is manifested mostly through Lord Brave’s gruff vocals. Gruff still does not mean growls on A Tomb for the Haunted. Another association with death metal is perhaps the lyrical subject matter, more mystical spiritual horror than gory violence, definitely not as gross as you might think looking at the cover. All in all, Deceased would be my best analogy and I am on that sort of kick in light of refreshing myself recently on Supernatural Addiction. Although I can't claim I extracted equal pleasure from all songs on the A Tomb for the Haunted, some cuts here definitely deserve praise and repeated listens. Raising the Occult, The Spirit in the Tower, Emily, The Tree of the Hanged and the title closer rise above the fray. These songs in particular inject energy, melody and special standout elements. Raising the Occult is the first to pick up speed and deliver a hooky melodic chorus. Agony Lords guitarists Mauricio Barami and Jorge Inukai are good at swimming melodic leads throughout, but making guitars in the leading section of Emily sound like sitar further emphasizes mid-eastern feel of the song. The band can get pretty crazed and punishing (The Phantom Book), but when they make dark melodies do the work (The Tree of the Hanged, A Tomb of the Haunted) they are at their best. The dark balladeering of The Tree of the Hanged, the tortured melodic moments on the title track, when guitars and vocals are so in tune reflecting anguish and pain, remind me of Evereve on Stormbirds while The Spirit in the Tower can garner references to Amok period of Sentenced. Drawing comparisons to those two very unique albums is a high praise in my book, if you want to take that to the bank. Doing their own thing and trying not to emulate others is certainly commendable and allows me to overlook the moments on the A Tomb for the Haunted which enthused me less. Gritty authentic production, the properly placed samples of shutting coffins and digging graves complete the atmosphere suitably.